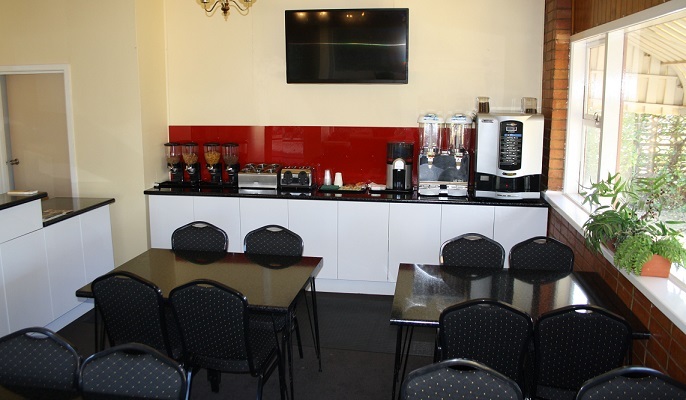 Nhill Oasis Motel provides value for money accommodation halfway between Adelaide and Melbourne on the main Western Highway in Victoria. This retro "Route 66" boutique motel features modern amenities in a nostalgic atmosphere, - one of the first motels built between Adelaide and Melbourne. We have 24 hour check-in (phone after 10pm), Large flatscreen TV, free wireless internet, self contained units all with a fridge, microwave, kettle and hair dryer. A complimentary continental breakfast is available between 7-30 and 9-00am in the motel's breakfast bar consisting of your choice of cereal, toast and juice. Largest selection of playable pinballs in Australia, featuring machines from the Australian Pinball Museum collection. A free breakfast is available in the morning between 7:30 and 9:00am in the motel's breakfast bar. This consists of cereal, toast, coffee, tea and juice. This retro "Route 66" boutique motel features modern amenities in a nostalgic atmosphere. Nhill Oasis Motel was one of the first motels built in Australia, inspired by the huge motel popularity in the 1950's along the famous "Route 66". Halfway between Adelaide and Melbourne. Nhill Oasis Motel is adjacent to the Australian Pinball Museum - Australia's only pinball museum. The museum features rare and highly collectable pinball machines which are all playable.